On August 22nd, Sugisaki sensei and the editors of Asuka came to Tongli publication for a little interview and an autograph section. I was born in Dec 26th, Capricorn, bloodtype O, hobby is to watch shows plays, video games, or go out with my friends. What kind of shows? Movies? Recently sensei uses computer to draw! It's great! What kind of equipment do you have? Three main computers and 2 monitors. You liked computer graphics for a long time? But sensei does not use only the computer for the whole of the picture, it's only for doing the effects. Did you go to computer class? No, I obtained the skills on my own. Actually, in Japan not many people do CG, and most shoujo manga needs a dreamy kind of feeling, and CG has a flat feeling, so in the field of shoujo manga, CG is very rare. Sugisaki sensei's manga is a mix of shounen and shoujo, so the outcome of using CG is very good. Do you colour directly on the computer? Actually I do not do a lot on the computer. First I draw the coloured picture by hand, and then scan it into the computer in order to fix the colours and add some effects. 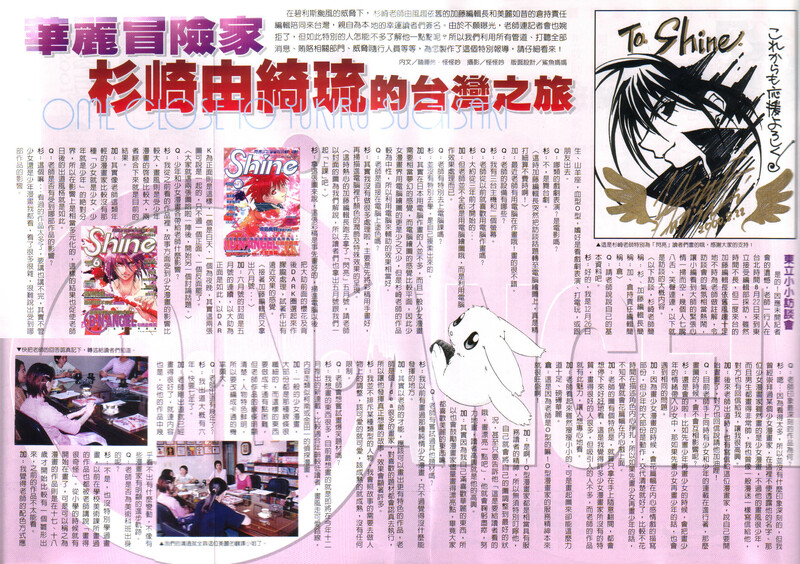 (Katoh went and grabbed a Shine, May issue, to let sensei to tell us how she did the cover. note: it's the one with Daisuke in the front with a lot of sakura) In this picture, the coloured original was drawn first, after I scanned it onto the computer, I masked the sakura in front of and behind Dark, and then blur it, trying to get a feeling of distance into it. What are the influences of shounen and shoujo manga? From all the manga I have read before, shoujo manga influenced me on the story aspect, and shounen manga influenced my style a lot more than shoujo style. The two combined is what I have right now. The young mangakas like Sugisaki sensei does not have the idea of "shoujo is shoujo, shounen is shounen," that kind of boundary does not exists, so the influence is very complicated, and that results in her style right now. Do you have any influence from a specific manga? Well, I read too many manga, it's impossible to tell you all of them. No matter they are shounen or shoujo manga, I read them all, so it's hard to say which one influenced me the most. Is there a manga that impressed you the most? Um.. Because I read too many, I don't remember them. But I used to like a shoujo manga a lot, in here I can't tell you his/her name. Although she is a shoujo mangaka, but her style is shounen, all the guys she drew is so cool, like the other manga fans I also wrote him letters, and I also got a reply, makes me so happy. When Sugisaki debuted, she also wrote letter to this mangaka, telling him that she also started drawing manga, she recieved a reply telling her to "ganbaru"!! At this moment, you have both shoujo and shounen manga running in magazines, so when you draw, do you get confused? Of course. If I draw shounen before shoujo, I'd bring the shounen manga's emotion into the shoujo manga, vice versa. When drawing shouuo manga, you have to spend a lot of time in expressing the emotion inside the characters, but shounen manga is mainly action, you don't have to say a lot about the character's internal emtions. If she draws shoujo manga before shounen manga, she will unintentionally spend more time into the characters' emotions. There's something special in Sugisaki's pictures. If you just flip through the manga, you will want to stop and read carefully, this is something not a lot of shoujo mangaka has. There are many people who can draw good, but not many are attractive. And her manga has this special attractiveness to it, makes people want to read it carefully. She looks very skinny and small, but when she draws is very powerful and beautiful. Because the blood type of Sugisaki sensei is O!! Mangaka with blood type "O" is good at servicing their readers! Yeah!! So even if we don't tell her, she'll draw the pictures perfect. We only have to tell her that "it's for the readers, draw prettier" and she'll put all her energies into it, reader's happiness is sensei's happiness. Because I like beautiful things, so I always encourage the mangaka to draw more beautifuly, since most of us also love seeing beautiful things. Did you try other genres? I used to draw those innocent shoujo manga, but there is not a lot I can do. With Sugisaki's talents, I think she can draw something more different and special. She is one with a lot of ideas, and for the things she loves, she'll take it into action very seriously, so we let her to draw whatever she wants, the result is good. I don't avoid a specific kind of character. I'll change the character according to the story. If it should be cute, I'll make it cute. If it should be mature, I'll make it mature. There's no limitations. Will you try to draw the crazy, funny kind of manga? I have a lot I want to draw. For now I want to draw the new story that will begin in Decemeber. It's suitable for younger audience, the style is cute, and the storyline will be like Kindaichi kind of detective manga. Most common shoujo manga, the lines are very thin, that kind of things is hard to put into anime. But sensei has a lot of potential to be put into anime. How long has it been since you first debuted? It's almost 6 or 7 years..
She was very good at drawing already when she first debuted, even the story are good, so from her manga, you don't see a lot of change, unlike other mangaka which shows some significant improvement. Did you take art class? No, I didn't learn to draw specifically. The pictures I drew in school's art class are commented to be "very strange" by my teacher. I started drawing since elementary school, but a "manga" came when I was 17, 18. All the stuff before that was not good. I think the colours come quite natural for sensei! Like the character is a Japanese, but she coloured the hair in purple, there is no limit, it's free to use whatever colour is available, and she's good at matching colours. I think in the covers of Asuka, Sugisaki sensei is relatively good. We know that you have worked on doujinshi before, is there any influence? Doujinshi is completely a personal hobby. I know that many mangaka are discovered through doujinshi. But I have already decided to join the competition, so doujinshi is only a hobby for me, it doesn't have much to do with how I got started. She is still drawing doujinshi, but because she is a professional, so the style in doujinshi and commecial manga is different. Do you use a different name or real name? I use "Sugisaki Yukiru." If there is a game or novel that I like, I will draw them out. But my main target is still the manga running in magazines. I think doujinshi, even if it sells very good, it will be limited by the region, but for Asuka, this kind of commercial magazines, no matter where you live, all you need to do is to order a copy from bookstore. Sugisaki sensei wants her manga read by more people, so she's only putting dojinshi as a hobby. Why do you like rabbit so much? What colour is your rabbit? It's pure white colour, very beautiful. Do you think you'll draw a manga based on rabbits? I won't have the rabbit as the main character, but I'll have them as sidekicks. Which rabbit character do you like the most? Sugisaki's mother is more fun! She also likes rabbits a lot. She rearranges the rabbit decorations at the door according to seasons. What kind of guys do you like? Do you have an official website? It's now under construction. Sensei has a lot of ideas, when it is ready for the audience we will let the readers in Taiwan know. Please go to there later and have a look. When D.N.Angel restarted in May, the readers send in a lot of D.N.Angel drawings! Really? Thank you very much!! Sensei also has a lot of fans in Japan, their ages are around 14 and 15. So what do you think of the readers in Taiwan? I received a lot of letters from Taiwan, but because they are in Chinese so I can't understand, I can only guess the meanings. During the autograph section, I think the Taiwan readers know better how to express themselves, it makes me very happy, I got a lot of energies from it! Sensei is very serious about her job. Please support her! that's the end of the interview... I decided not to translate the other part of the whole article since you'll probably be confused by all the place names and people names and food names... etc.